Change Management with KACE – The Indigo Way. So there has been plenty of discussion as to whether or not KACE can support a Change Management process within the Service Desk area of the tool. In the last month or so you may have seen one blog suggesting that you use a process to do this, and that is certainly one way. But I thought I would share with you the way that we produce a Change Management Queue, so that you can see an alternative. First thing to say is Approvals, as always KACE engineering seems to think that the only time you will need an approval is as any ticket is logged, I can remember back to 5.3 when you could add in an approval step at any time in the ticket lifecycle. Guys, if you are listening, this would be easier if allow an approval to be set when a ticket reaches a user defined status and when approved it then sets the ticket to another user defined status? So using the approval loop within KACE will really not help you unless you have a process and child tickets, one of which is the CAB approval. Second thing to say is that if you are looking to KACE to perform a voting style of CAB, whereby the majority of CAB members vote yes and the change is approved then KACE is probably not mature enough for you. Although I will point out, as in previous discussions, the CAB may approve but actually it is just down top one resource, the Change Manager to actually approve the change and set any implementation steps you may have in process. We always start with the Change process itself. I always ask customers looking for Change Management if they have a process, and if the answer is yes then I ask them to produce a printed copy of that process. In the majority of cases customers then admit that a Change Process is a desirable and as such not yet formally documented or implemented. In which case we look at a standard process, much like the following diagram. 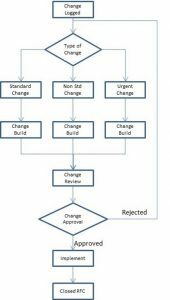 In this simple flow we can see that there are a number of paths depending on the urgency and the type of change, but there are also steps in the process that are common to any type of change, that of build, approval and implementation. 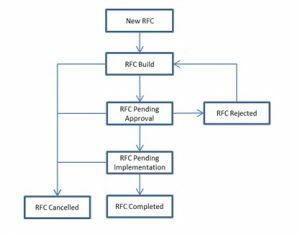 The key to managing Change within a KACE queue is the status of the Request for Change (RFC). As the ticket within the queue moves through the process flow, it will change status. This illustrates where the request is, it makes Change reporting much easier and also it helps us to configure the queue. With a standard ticket queue the status is usually open to be changed by any analyst with the correct rights to the field. After all it is essential when wanting to resolve or close the ticket to be able to set the status appropriately. However, within the Change Queue we make the Status a read only field and the status only changes when we update the ticket with appropriate data. So an RFC Ticket will start life with a status of New RFC, then will change to RFC Build, RFC Pending approval etc as the ticket is updated within the queue. Ticket rules are created to deal with every stage of the process, in each case looking for data to be added, when it is, updating the status and also using the email function within the ticket rule to send alerts or to ask the next person in the process to contribute. So what does our Change Management Ticket Look Like? Change Title – Should contain the title of the change, this should be descriptive and unique where possible. Change Summary Details – Provide basic details of the change in the Comment box. Status – This field is read only and indicates at what stage the Change process is for the ticket. Category – Enter a category and subcategory to describe the type of change that is being logged. Next Action* – The Next Action drop down is used to carry out specific tasks at various stages in the change process. Asset/Device – if the affected Asset or Device is known it can be selected from the Asset or Device list. To save the Change Request, press the Save or Apply Changes button. 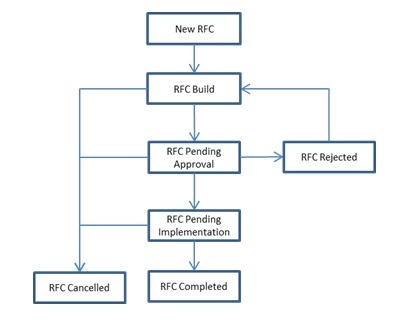 To build the RFC, the analyst must open the RFC and complete the following fields. Category – If not already selected, enter a category and subcategory to describe the type of change that is being logged. Implementation Plan* – Replace the default text, “Add Implementation Plan Here….” by entering the steps that will need to be followed to implement the change. Test Plan* – Replace the default text, “Add Test Plan Here….” by entering the steps that will need to be followed to test and prove that the implementation plan was followed and that the change was successful. Back Out Plan* – Replacing the default text, “Add Back-out Plan Here….” enter the steps that will need to Roll Back the change if to the change is not successful. Once these fields have been completed the RFC build is complete. Save the Change Request by pressing the Save or Apply Changes button. The RFC must now be forwarded to an approver for the Change to be assessed and approved. As we navigate through the stages of the change the read only Status field updates and the Ticket Logging information field updates with instructions as to how to move the change to the next status. With approvals, we have a defined approver, the change manager, they will get an email to approve and they can either respond “Approved”, we can setup action buttons in their Outlook mail client or they can edit the RFC directly in KACE. We also have custom rules running to ensure that only the Change Manager can approve the change ( i.e. 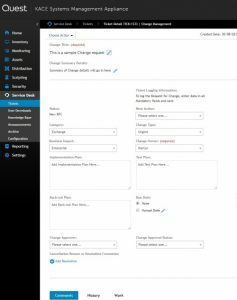 change the value in a certain field at a certain stage of the process) Otherwise the value is reset and an email sent to the Change manager to let them know someone has tried to edit the change without rights. Finally we also have custom rules that reset the data values appropriately if an RFC is cancelled or rejected, placing the ticket in a state that is correct to place it back in the process flow at the appropriate place. All of this usually takes us about 5 days to setup, which includes consulting with the customer, editing the process flow before build and training and documentation at the end. All of which adds up to yes, I think we can do Change Management within KACE and there are customers out there today managing Change in this way.